We are happy to share with you the videos of the first edition of our Serious Sound Sessions series and on top of that, we would like to introduce the next session with Matt Wiggins! Using tuned glass bottles to create ‘Michael Jackson inspired percussion elements’ and the importance of limiting yourself to keep your creative mind going… Last February we hosted the first edition of Serious Sound Sessions where our special guest Ali Staton shared these ideas and presented many of his very interesting production techniques while deconstructing the mix he engineered and produced for Turin Brakes’ single ‘Keep Me Around’. From the demo, to the recording, to the mixing. During the 1,5 hour live stream via both Facebook and Youtube, Ali spoke about the whole process. Besides sharing his personal and sometimes unusual production tricks, he also spoke about his approach to producing and engineering this specific band and the variety of techniques used while doing so. An inspiring masterclass, giving a very interesting and broad perspective of the creative process from an engineer/producer point of view. You might think ‘Aah, too bad I missed it!’. We understand. But we got your back! We edited the 1,5-hour stream in 3 parts and added some additional video material for you to enjoy. You can find the videos below. We were very happy having Ali Staton himself in Amsterdam for the first edition of Serious Sounds Sessions, powered by and with special thanks to Universal Audio. And we are super excited to announce the next edition, which is scheduled for Sunday the 15th of April with mixing/recording engineer and producer mr. Matt Wiggins. Matt is a mixing/recording engineer and producer based in the UK, and not just any. After studying music technology at Salisbury College, he developed his skills within Miloco Studios working with a number of leading producers including Paul Epworth, Ben Hillier and Spike Stent. The variety of recording and mixing sessions enabled Matt to hone his skills using a diverse range of recording equipment from the classics to the bizarre. In 2011, Matt began engineering full time for Paul Epworth, leading to projects in the UK and stateside including Paul McCartney’s ‘NEW’, Adele’s award-winning ‘Skyfall’ and the Foster the People LP ‘Supermodel’. Since then Matt has worked on outstanding albums and with artists like U2, The Stone Roses, Lorde, London Grammar and The Horrors, just to name a few. He also engineered and mixed tracks on the Glass Animals album ‘How To Be A Human Being’ which won this year’s MPG Album Of The Year award and for which Matt was nominated as Recording Engineer Of The Year. As well as engineering with Paul Epworth at The Church [Epworth’s studio], Matt recently set up his own studio at Strongroom for mixing and production duties. 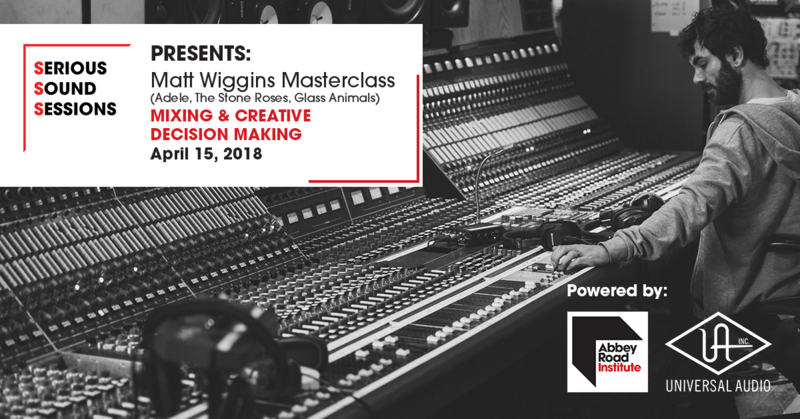 We are very excited to welcome Matt Wiggins for our second edition of Serious Sound Sessions at the Abbey Road Institute Amsterdam facilities. This unique masterclass with Matt Wiggins for the 2nd edition of Serious Sound Sessions offers an incredibly valuable insight into the creative decision-making process. Besides that, it will give a very interesting comparison between the before and after version of the track. What else do we need to say? You can attend this masterclass through Facebook Live, where you can ask your questions real time to Matt Wiggins himself!